I found that Lowrance Off Road GPS systems are popular and widely used for ATV and snowmobiles. Often off-roader guys and gulls are addicted angler and hunters and already have Lowrance GPS Chartplotter. If someone is lack of one the good idea is to get such a GPS to fit on both, the boat and off-road vehicle. Here it comes Lowrance HDS-7 Gen3. Mainly it is produced as GPS for boats but perfectly fit for off-road trails and even can be uploaded with ready to go tracks like street turn by turn navigator. Let’s skip boat option as You can find even in some of my previous posts about Lowrance brand HDS GPS devices. 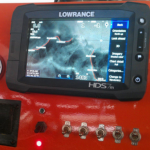 This post I would like to add my two cents for Lowrance GPS for off-road use. As always I started my research with Amazon Customers Reviews threads. I hardly found any drawback or claims except someone who put one star dissatisfied with the fact that he can not use outside of the USA. Actually, I do not believe such allegations as Navionics maps are almost global coverage but ATV and off-road trails you can create and store by yourself. What can this have to do with national borders? Even though it is mainly for use on boats many off-roaders have found how to install it on ATV, OHV (off-highway vehicle) and even on snowmobiles as operational ambient temperature for Lowrance HDS 7 3 gen is -15C to +55C/5F to 131F. In this regard, another reminder for the smartphone fans (including me). No iPhone or some other cool featured smartphone will ever work at low temperatures. All claims against are nonsense. Regarding this, I have many proves during my ice fishing adventures. I know that to find a good fishing spot using iPhone GPS and right track back to the camp place the phone must be kept in the inner pocket close to the heart. It is enough a couple of minutes -10C and battery show zero. Sometimes an external battery charger can help, but it even needs to be held in a warm place. Most of the smartphones are so many great features and tons of useful apps, but $1K worth iPhone X is not for extreme use. Even the most durable Caterpillar gadget hardly withstand extreme conditions. Well, back to Lowrance HDS 7 for off-road trails and tracks. 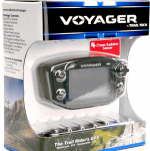 I have posts written about Trail Tech Voyager for ATV trails and Garmin Montana 6xx series handheld GPS devices. All of them are great tools widely demanded and known for extreme vehicle owners. I can say it with high confidence as more than hundred these devices have been purchased on Amazon using my links with a tiny percentage of returned items. I count it as the best index of the product quality. You can easily create your trails even using Google Maps and store it on an SD card or internal memory. It is simple, so no any particular bits of knowledge needed. The only problem could be the installation of this 7-inch screen device on your vehicle. When thinking a little or looking for ideas on Youtube, you can always find a solution. And finally, of course, the price. It is higher than even most expensive Garmin 680t and reaches almost$700. But! 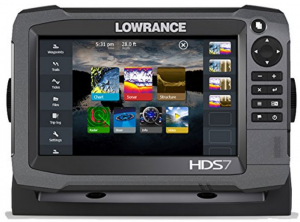 But do not forget that you can use it on your boat not only as GPS tracking device but Lowrance HDS 7 GEN3 is the top range fishfinder/chartplotter unit and fully can be used as a serious fishing tool or as a full range navigation device. My warmest recommendations, take a look when you are about to choose the next GPS device purchase. Next Next post: Garmin Striker 4 Bbuilt-in GPS Fish Finder for Ice Fishing Best In Budget Range. This is pretty cool! I will admit, I tend to rely on the GPS of my phone way too much. Most of the offroading that I’ve done, whether on bodies of water with my kayak, or riding ATV has likely been outside of the range that my phone could handle. I have generally relied on the guidance of a human guide to help me. But for when I am starting to do more offroading alone, I will need to keep this in mind as a good investment. Hi Jordan, and thank you for taking the time to comment! You are right that for more or less real off-road rides relying solely on the smartphone can lead to staying without navigation at all. I wish I had read your article just a few ago. I was in a weird situation where my GPS just could not find the address and I never knew that I had to load the mapo before leaving on the trip with that particluar GPs. Very good article and very educative too for people like me. I will definitely give Lowrance HDS 7 for off-road trails and tracks a try. Sound the best device out there. Hello and thank you for taking the time to comment! Actually, you can find other brand GPS devices for off-road trails like Garmin or Trail Tech but Lowrance HDS-7 Gen3 is smart choice if you want shoot two rabbits with one bullet, for quad, sled and boat. Hi there I’m using Hema maps on an Ipad which is starting to have trouble , do you know if the Lorance would load Hema map package to HD or it would need a micro SD with the maps on it . Looking to upgrade the Ipad and don’t want to buy the new HN-X or HN7 ,we live in Western Australia and do a lot of remote out-back travel and need something reliable and easy to use , have used Lorance and Huminbird plotters for fishing and love the way they work so this would be an option for me, just Hema do awsome map packages for 4×4 touring and out-back travel. Hi, Solly and thanks for the question which leads me to do the more detailed exploration of the topic. The short answer I guess is no. I do not believe that Lowrance HDS will read the Hema Maps. You can try to somehow convert to .gpx format, but I am not sure that it will work. But you can go another way by connecting your iPad Wi-Fi with Lowrance HDS Gen 3 and screen mirroring it. I made some research on Hema maps and have to admit that it is really good and convenient for off-road for Down Under adventurers in particular. Have a great day. Happy to read your article today, my husband and I are planning a trip to visit Ontario in two weeks, as we keep making plans to visit some new places, the question about how to get there came up. Nothing better that to have a Road GPS to be sure to get anywhere the best way and get lost on the way, as that happened to us a few times. I will forward your article to my husband, I’m sure he will be interested to read it. Hello Alejandra and thanks for stopping by. Those Lowrance HDS series GPS device is pretty versatile high-end navigation tools. You can easily use it on the car, boat and any off-road vehicle. Hi Andrejs, Thanks for not only providing a helpful review of the Lowrance Off Road GPS system but also explaining that smartphones and other electronic gadgets don’t work at low temperatures and what to do about it. I had no idea there was such an easy solution. Brilliant! Appreciate the tip! Hi Lauren and thanks for stopping by. When I go out in winter, my iPhone is hidden deep in a warm pocket. 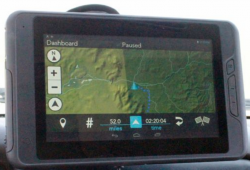 When the GPS direction is needed, then take it out quickly, check a position and push back into the pocket. None of iPhone cases can withstand low temperatures for long. Great Post! The Lowrance looks very cool from the picture you have provided. I suppose I shouldn’t be surprise considering the age we live in, but the display looks absolutely fantastic, it looks like a proper tablet rather than a GPS device. I am used to those tiny little grey boxes with the tiny map. Its pretty cool that it can be used on boats as well. That tells you exactly how durable it is being exposed to water all day long. I am one of those people who can get lost very easily and I l\know you can use a smartphone but I think I would prefer having a mounted unit like this in my car. 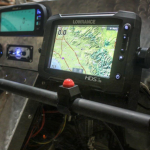 Lowrance HDS series GPS devices are not cheap but they can be used almost on any vehicles boats and airplanes as well. The quality of Lowrance products is very high. As a climbing lover myself, I have heard about off road GPS devices and this article came just in time as I was looking for one to enhance the quality of my so beloved activity by constantly knowing where exactly am I as well as discovering new gorgeous spots and marking them on my device for future returns! Obviously for me the biggest advantage of owning such device would be that the range of offroad trail tracking is soo much improved and extented in comparison to my phone, which makes climbing so much more enjoyable as well as much more valuable! Thanks for such informative and detailed article, I found it to be very helpful, keep up the good work! Thanks for the comment Evald. In fact, there are not so many GPS devices for off road trails. The Trail Tech Voyager is a dedicated trail maker device and some Garmin Montana series. Lowrance from the very beginning was just for military use, and it has not lost the best in public-made products as well.